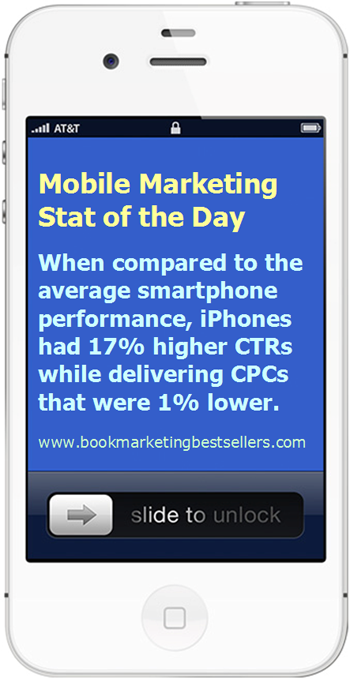 When compared to the average smartphone performance, iPhones had 17% higher CTRs (click through rates) while delivering CPCs (costs per click) that were 1% lower. On the other hand, Android mobile devices exhibited over 30% lower CTRs, with CPCs 2% higher than average. While Windows Phone 8 delivered 150% higher CTR with only a 1% higher CPC. Understand Mobile Intent — Mobile search is different from desktop search. So tailor campaigns and user experiences to reflect this. Adopt Mobile Ad Products — Design campaigns that really supercharge mobile ads. For instance, both Bing and Google offer location extensions that add a business address and phone number to your ads. Focus on Local — By definition most mobile users are mobile. They’re on the go, not sitting at a desktop computer. That means that many of their searches have local intent. They’re looking for restaurants, shops, or attractions generally within a few miles of their current location. Help mobile users find your books by making sure your website is mobile responsive!